Trailing Fairfield Prep by 13 points heading into the fourth quarter of its Class LL state tournament opener on Tuesday, Norwalk wasn't willing to write off its season just yet. For the Bears, the eight minutes that read on the scoreboard clock at Alumni Hall seemed like an eternity, even if it really wasn't. They had been in the same situation before this year, looking lifeless, behind by double digits, only to rally back and make it a game. And again, after sparking a 9-0 run to start the fourth, the Bears found themselves in that same scenario. Only this time, sixth-seeded Prep, fueled by its Division-I swingman, wasn't going to let the Bears do it for any longer. Norwalk guard Jabari Dear's potential game-tying 3-pointer with just seconds left bounced off the back rim as Prep held on for dear life to a 63-58 win. "That's kind of what's happened to us all year," Norwalk head coach Tom Keyes said. "Our kids didn't quit. They didn't give up and they kept playing hard." William & Mary-bound senior Terry Tarpey poured in a game-high 26 points--15 of which came in the first half--to help Prep. Tarpey scored nine of those points in the third quarter as Prep, last season's runner-up in Class LL, built a 17-point lead behind an 11-0 run. "We thought we put them away a couple times," Tarpey said. "Credit to Norwalk, they never gave up and they played some great defense on the team, and especially me." With its leading scorer and floor general, senior point guard Rasheen Thompson, on the bench and saddled with foul trouble, Norwalk turned its full-court press defense into offense in the fourth quarter, and sliced into the large deficit. The Bears tied the game, 55-55, with just over three minutes left on a three-point play by forward Roy Kane Jr., but Tarpey responded with a bucket to retake the lead. "Terry, to his credit, stepped up and said `Guys, this is not the way we're going to go out. This is not the way we're going to go out.' We started making better decisions," Prep head coach Leo Redgate said. "They were really good at forcing the long pass and picking it off," Tarpey said. "We made some adjustments, called some timeouts and we figured out a way to pass through it and be confident." With Prep leading 61-58 with seconds left on the clock, guard Thomas Nolan missed the front end of a 1-and-1 to keep Norwalk alive, momentarily. Dear pushed the ball up the court and got a relatively clean look at the basket to no avail. "It looked good to me," said Keyes, who concluded his first season at Norwalk with a 10-11 record . "I was ready for overtime. I think if we go to overtime there, we have a lot of momentum the way the game was going, and I like our chances." 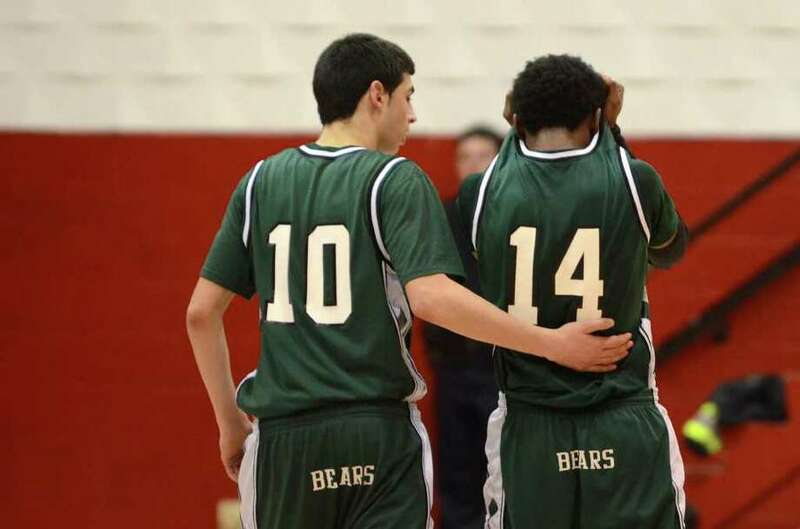 Dear led Norwalk with 18 points, while Kane Jr. had 14 and forward Saeed Soulemane scored 11. Thompson was held scoreless. Prep (20-3), which led for nearly the entire game, got 13 points from forward Tim Butala and 11 from Ryan Blake. After seeing Prep do just enough to weather Norwalk's late rally, Redgate believes his team has "a lot better basketball to play." "We understand what it takes. Those five guys that are on the floor have the potential to win us a state championship," Redgate said. "We've been thinking about it all year long. I think this was a bad game."